While standing in front of his tribe's totem pole, Tlingit Tribe member from Klawock, Alaska Jonathan Rowan speaks about the significance of the totem pole to his Tribe at the Honolulu Museum of Art. A stolen totem pole that went from the garden decor of two golden-age Hollywood actors to the basement of a Hawaii museum has been returned to Alaska tribal members. Barrymore, star of "Grand Hotel'' and grandfather of actress Drew Barrymore, displayed the pole in the garden of his California estate. After Barrymore's death, actor Vincent Price, known for horror flicks such as "House of Wax,'' and his wife bought the item and also used it as a yard decoration. The couple donated it to the Honolulu Museum of Art in 1981. Langdon learned the pole was used for burials, and that there were remains of a man inside before Barrymore had it erected at his home. Langdon does not know what happened to the remains after they were removed from the pole. A totem pole carved by the Alaskan Tlingit Tribe is boxed up at the Honolulu Museum of Art, Oct. 22, 2015, in Honolulu. Museum officials didn't know the pole was stolen. With permission from tribal leaders, Langdon came to Honolulu in 2013 to examine the pole, setting into motion a repatriation process funded by the Native American Graves Protection and Repatriation Act. On Thursday, seven Tlingit tribal members who traveled to Honolulu from the southeast village of Klawock wore lei, sang somber songs, handed out gifts and thanked Hawaii for taking good care of the pole. With the scent of cedar wafting in the air, his daughter Eva Rowan brushed three feathers along the pole pieces bearing carved images of a killer whale, a raven, an eagle and a wolf. Only the top section of the pole was displayed briefly in the museum, and the pole spent most of its years in Honolulu in a climate-controlled basement. "I take some comfort in the fact that we've taken good care of it,'' said Stephan Jost, the museum's director. It was among more than 100 totem poles that once stood in the old village of Tuxecan on Prince of Wales Island, Alaska, which was inhabited by the Tlingit people, the museum said. 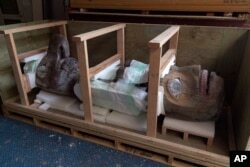 The pieces were cradled in packing foam in wooden crates that museum workers sealed after the ceremony. The pole will leave the museum Friday, and set sail for Alaska on Tuesday.